"Who do we think we are? 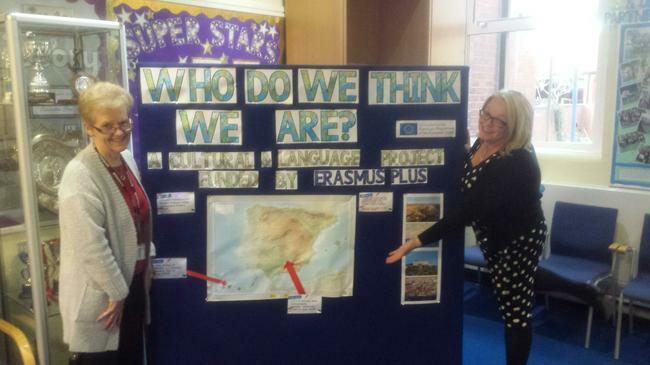 A language and culture Heritage project by Erasmus Plus "
Parkgate Junior school has been awarded funding from the European Union through the program Erasmus +. The project called "Who do we think we are? A Language and culture Heritage Project" has been the result of the joined efforts of three other UK partner schools and two Spanish schools. Funds have been granted to allow a group of children from our school to travel to our partner schools in Spain in spring 2019 and spring 2020, and for the children of these schools to visit Watford partner schools in summer 2020. The project was presented to children at Parkgate Junior School on Tuesday 23rd October during the special assembly led by the head teacher Mrs Pipe who left all the Year 5 and 6 children day dreaming about visiting the partner schools in Spain. Applications are now open for the children who would like to become Culture and Language Ambassadors of the school and travel to Cordoba in early June. A panel of teachers from other partner schools will also be participating in the selection process in order to guarantee the maximum fairness, in case the number of applications should exceed the number of places available, which is 15 per school. The deadline for submissions is 9th November. For more information, please contact the school office.